It seems a no-brainer that chainsaws wouldn't be an acceptable item to take as luggage on a plane, but a man in New Plymouth gave it a go anyway. After getting upset when he was told he couldn't take the chainsaw on the plane, the man missed the 4.40pm Jetstar flight to Auckland which left and arrived on time. He then boarded a 7.15pm flight which was delayed by 67 minutes after the plane's captain kicked him off for behaving badly. New Plymouth police senior sergeant Bruce Irvine said it appeared the man had tried to take the chainsaw onto a Jetstar plane and became upset when flight staff stopped him. The police were called about 5.20pm on Monday as a precaution in case the situation got out of hand, Irvine said, but the situation was sorted out before they arrived. "They resolved the argument over the chainsaw and he accepted that he couldn't take it on the plane," he said. "No one got arrested," Irvine said. "It sounds like a storm in a tea-cup." Petrol fumes in a chainsaw's tank can be highly explosive and are not recommended either in checked luggage or as carry-on. In other parts of the world, trying to bring a chainsaw into an airport and then behaving badly, with the police being called in, might yield rather worse outcomes. Nobody was beaten, shot, or even arrested. Instead, they just resolved the argument over the chainsaw. And this is as it should be, here in the Outside of the Asylum. Recall too that, following Boes & Stillman, the RDD estimates around the time of the birthday would be larger than the longer term effects one might extrapolate from the RDD (the paper rightly restricts things to the neighbourhood of the birthday and doesn't extrapolate). Using data on all soldiers between 2009 and 2015, we observe a large and significant increase in drinking after the 21st birthday overall, and the increases are largest amongst those who were depressed, had a family history of mental health problems, had better coping ability, and had higher cognitive ability. Despite the large increase in consumption, we do not find any meaningful impacts of legal access to alcohol - overall or in any sub-group - on any of the short-term outcomes we observe, including suicidal tendencies, depression, tobacco use, physical fitness, psychological health, deployability, smoking, and job-related infractions. They caution against extrapolating to civilian populations: the environment for soldiers is a bit more controlled, and soldiers might reasonably expect to be caught and punished for poor behaviour consequent to drinking. I'd expect you could extrapolate to say that the expectation of being caught and punished for poor behavior - individual responsibility if you will - is an important part of mitigating social costs. Nancy Maclean thinks there's some kind of Koch - George Mason conspiracy to subvert democracy. To make her case, she misquotes Tyler Cowen and James Buchanan in ways that reverse the meaning of what they'd written. And here's more on Buchanan and racism. John Small takes issue with my liking James Buchanan; I don't trust a single thing in MacLean's book to be accurate, so I see no reason to go through the book and debunk it. Seattle's $15 minimum wage reduced earnings among low-wage workers by cutting their hours. Here's the NBER paper. Dave Lane has an interesting suggestion: get tech students in high schools to provide the tech support. Ontario has a messed up alcohol system. The Liquor Control Board runs all retail sales of hard liquor, and they're up against the Ontario Public Service Employees Union. One union's fight with one government monopoly retailer almost shut down Ontario's access to the good stuff. One might expect that unions have inordinate bargaining power in that kind of scenario. Tim Harford has a great roundup on intellectual property issues. The usual suspects are mad that there isn't a ban on having cartoon characters on cereal boxes. I don't know how you explain rising obesity with a fixed effect: cartoon characters have been on cereal boxes at least since the 1970s. Mum generally refused to buy the ones with the cartoon characters, taking it as a signal that they weren't as good for us. I can still hum the tune from the ads for Count Chocula and Frankenberry though. Does inequality hurt economic growth? Maybe in less developed countries, otherwise not. Note too that where the route to riches is rent-seeking, you expect more inequality and less growth. America moves a step closer to enabling supersonic passenger transport. Letting supersonics conform to the noise restrictions on older subsonic planes rather than the requirements on new planes would reduce fuel burn by allowing more aerodynamic engines. New Zealand should do the same if it wants to be ready when the new generation of supersonic passengers planes is ready. Decentralisation doesn't work as well without fiscal equalisation. I liked this piece in National Affairs. I'll likely use it in the coming semester's Public Finance course I'm teaching at Victoria University. ...Chefs around the country have no doubt been stewing at the new "guidelines", but it was executive chef Dan Fraser at the historic Duke of Marlborough Hotel in Russell who put a match to the flambé. First he received an email from an MPI official. "You need to make some changes," he was told – the same stern message they were sending other restaurants and caterers around New Zealand. This is what you get when the government bears downside costs through the public health system and Vogons run things. If the justification is that people might underestimate risks of undercooked hamburger, then maybe you could make a case for putting warnings on menus about risks of undercooked hamburger. Maybe something like "Well done burgers are safest, but less tasty. We serve ours medium. Consider our non-burger options if that's what you prefer!" At least that version of things has some respect for individual preferences. Remember when National campaigned against the nanny state? I know it was a long time ago. I think they've forgotten too. I don't think we can blame the consultants for this one. Normally, big big numbers in economic impact reports are a black mark on the consultancy producing them. They don't come with enough health warnings, and the misleading big big figures draw headlines too easily. Universities NZ released Regional activity of universities (30 pages) on 27 Apr 2017 (UNZ media release). The report had straightforward analysis of the direct university spending and employment in their region, and the contribution to regional GDP. NZIER also estimated the indirect and induced expenditure due to universities, but placed major caveats on those figures, stating that UNZ had specifically asked for them. They noted that the government did not see such numbers as a credible argument for increased government expenditure on universities. NZIER repeated their 2-paragraph warning 9 times in the report, and added an appendix with more detail on the issue. Universities NZ cited the largest number possible ($19.95b) in their media release. Estimating the size of these indirect and induced effects in a way that is economically meaningful is problematic. They can be estimated using multipliers that try to reflect the ripple effects of university expenditure on the economy, but this approach makes so many assumptions that the estimates should be seen as indicative only. The multiplier analysis approach (used in the mid-2000s but now discredited) massively overstates the indirect and induced economic activity attributable to any industry because it fails to consider alternative uses for the resources employed by the industry. At best, multiplier based estimates of indirect and induced effects are a measure of the current footprint of the university in the city/region. They cannot be added to calculate a national total across cities/regions and they are not accepted by central government as a credible argument for increased expenditure on university education or R&D. Though indirect and induced effects are estimated in this report they should be seen as indicative only. See Appendix A for further caveats and comments on indirect and induced effects. Pretty blunt. When clients use the big big numbers, even when the reports have health warnings as blunt as these are... yikes. Courtney Place pub Molly Malone's was damaged in last year's earthquake. The building is old, but not heritage-listed. So it fortunately can be demolished, as the owners wish. That doesn't mean the heritage people didn't try to block it anyway though. "In this case, the building has been identified by the council as earthquake prone … [and] the applicant contends that the building 'is a clear and present danger to the public'." In addition, the owners planned to fill the space in the interim, and eventually rebuild, meaning any effects on the streetscape would be temporary, Hayes said. However, the council's senior heritage advisor Vanessa Tanner opposed the demolition. She said that while the build was not heritage listed, it had significance in terms of the build and social context. Heritage New Zealand also weighed in, saying the loss of the Molly Malones building was regrettable due to both the heritage qualities of the building and its place in more recent social history. [Council Senior consents planner Lisa] Hayes said there were no rules preventing its demolition as it was not a heritage building. "While I acknowledged the advice of Ms Tanner that there will be an adverse heritage effect associated with this loss, this will be a public effect and needs to be balanced with the risk to public safety if the unsafe building is to be retained," Hayes said. Wharton's Katherine Klein has a nice literature review up on the effects of corporate boardroom gender diversity. The bottom line seems to be no effect. That's consistent with my read of things as well. But be careful here too: there being no relationship doesn't mean that quotas or mandates would be costless. You'd need to specifically sort through the studies that looked at effects of quotas, because changes in board composition that are board initiated might differ from ones that are compulsory. Do immigrants vote for the broken institutions they fled? No. No they don't. America foisted Anti-Money Laundering legislation on New Zealand; New Zealand used it to kill iPredict and make it damned hard to run international remittances. Meanwhile, New Hampshire exempts Bitcoin and virtual currencies from money transmitter regulations. A bit like how American pressure in international forums makes drug legalisation harder, while US states legalise. There's much to be said for federalism. The anti-GMO cult goes after some petunias (NBR $). They've been sold since the 80s and are harmless, but somebody just noticed that they have a corn gene. Amazing that MPI has resource for witchhunts. There was never an idyll of a sovereign modern state unconstrained by bond markets and financiers. Bond markets rather helped create the modern state. A European official, speaking on the condition of anonymity because he was not authorized to speak, characterized the state of things as a "row." Canadians haven't been transparent enough about several aspects of CETA's implementation, the source said, and presented the cheese quota decision as a non-negotiable fait accompli. It was a final straw for upset Europeans who had been otherwise eager to get on with the deal. The source said Canada informed the EU that 60 per cent of the new import quota would go to domestic dairy producers and processors. Europeans fear they won't use it, so fewer new cheeses compete with their domestic products. If the quota's unused, or there's any incentive to delay imports, Europe could be effectively denied the market access it fought for years to get. CETA provides a way for complaints like this to be resolved, but Europeans would prefer not to have to sue Canada after the fact, the source said. Emphasis added. So opening up to greater access to European cheeses gives the bulk of that import quota to the existing dairy cartel. Recall that rather a few of Canada's dairy processors are cooperatives owned by quota-holding Canadian dairy farmers; I've not seen anything on how that 60% gets split. If a decent chunk goes to the companies that haven't quota interests, maybe it wouldn't be so bad. But still: more reasons to be skeptical about the merits of including Canada in free trade deals if trade in agricultural goods matters. Canada considers taxing broadband internet services to fund Canadian Content. If there's some public good case for funding the creation of Canadian content, the burden of providing the public good should fall through the tax system on the public at large. A source explained the revenue stream generated by the current cable levy is no longer sufficient in an age of cord cutting and “over-the-top” services that stream content over the Internet. Under the new proposal, an additional tax would be levied on “broadband Internet providers.” It would ideally apply to high-speed Internet services that allow for the streaming of music, movies and TV shows, but not to slower and less costly services, the source said. As such, proponents of the proposal are branding it as a “streaming tax rather than an Internet tax,” designed to bring the existing cable-based system in line with recent technological changes. It isn't a tax. It's just a compulsory fee levied on a particular consumption good, with the money going to the government. That's totally different from a tax. UNICEF's new report has made for some damning headlines about child outcomes in New Zealand. In a few cases the critique is deserved; in a few others, it needs a bit of context. UNICEF finds that fewer New Zealand live in relative income poverty than is the OECD average, in 2014 data. It is worth remembering that there is a sharp gap between those figures as measured before- and after- housing costs. If relative income poverty is measured after taking into account the costs of housing, the proportion of children in relative income poverty rises by about a third according to Ministry of Social Development 2015 figures. Since housing costs are a more substantial problem in New Zealand than in most other countries surveyed, UNICEF may be understating the seriousness of the problem in New Zealand as they appear to be using before housing cost figures. But it is a bit difficult to tell, since none of their numbers match up with the MSD figures. In many cases, New Zealand is not included in international comparison because New Zealand’s figures are not reported in ways that make international comparisons easy. But we can usefully look to the closest available New Zealand measures. UNICEF leaves New Zealand out of its measure of multidimensional hardship. MSD’s 2015 figures had material hardship, by the EU-13 standard, below the EU or OECD median when measured for the population as a whole, but slightly above it when measured for those aged below 17. This is due in part to New Zealand’s decision to provide more substantial income transfers to the elderly, through superannuation, than to children. Unfortunately, New Zealand’s figures on material deprivation only go back to 2007. The proportion of children both income poor and materially deprived rose during the GFC and has since returned to roughly pre-GFC levels. Figure G.6 in Perry is copied below. Similarly, while there is no recent official data on youth (aged 11-15 years) alcohol abuse, recent trends for those aged 15-18 have shown substantial declines in youth drinking. In the 2006/7 survey, 74.5% of youths aged 15-17 reported having consumed alcohol in the prior year; by 2014/15, that had dropped to 57.1%. New Zealand’s overall progress towards UNICEF’S Goal 3 around healthy lives may then be understated – though New Zealand’s very high youth suicide rates rightly are highlighted as well. UNICEF’s figures also understate the dramatic reduction in teenage birth rates in New Zealand. Statistics New Zealand reports that, in 2016, there were approximately 16 births for every woman aged 15-19 in New Zealand; UNICEF’s figures put it at 23. New Zealand’s teenage birth rate has roughly halved since 2008. The report worryingly points to that 16% of New Zealand children live in households in which no adult reports being in work. This is especially poor performance where employment rates in New Zealand are much higher than in most OECD countries, and are at or near all-time highs in the available New Zealand data. New Zealand fares relatively poorly on an aggregate measure of inequality that UNICEF constructs from two measures of income inequality, and one measure of the role of socioeconomic differences in school performance. All of New Zealand’s poor showing is due to poor outcomes for children in lower decile schools; New Zealand is at or around mean of reported countries on the other two measures. Lifting performance in poorly performing schools should be a priority. If the government’s investment approach to improving social outcomes is successful, New Zealand’s standing in UNICEF’s ranking should show improvement within the next few years. I had initially prepared these comments for Newsroom's Shane Cowlishaw. His story on it's here; I hadn't known he was on a 5pm deadline and got this through a bit too late to make it in. The New Zealand government finally got around to telling the tobacco companies what the rules will be under plain packaging. Plain packaging won't be in effect for a while yet, but it takes a while to adjust production lines - it's good that they finally got the rules out. Fairfax's Rob Stock called me asking for comment on plain packaging. I told him that the government should have put its efforts into getting a regulatory framework in place to allow the sale of e-cigarettes and other nicotine delivery devices (heat-not-burn products, and Swedish snus). The effects of plain packaging in Australia haven't been large, and a lot of smokers might be more responsive to available better alternatives than to ugly packaging. He didn't mention the Chipty report during our chat, but neither did I. When I said that it hasn't done much in Australia, I was thinking about it though. Chipty found that plain packaging reduced smoking rates by about a half of a percentage point. Rob presents that as tobacco-funded-me against an expert report, but I suppose it's more of a judgment call on whether a half a percentage point constitutes any kind of big effect. Anyway, here's the Chipty report. And here's something that's been bugging me about it; maybe if your econometrics are better than mine you can tell me there's nothing to worry about. Anyway, tobacco use has been in long-term decline. Just running a dummy variable for a post-implementation period would overstate the effects of the policy, as Chipty rightly notes. But Chipty solves this by throwing in a linear time trend. Now that would be fine if the time trend actually were linear. But if the actual time trend showed an accelerating decline independent of plain packaging, then you're back into the same problem. When I see something like that, I start wondering whether anybody ran a structural break test to make sure that the shift actually coincides with the policy change. If I had to eyeball it, it looks like a flat trend from 2001 through maybe 2005, then a decline through about 2010, then a sharper decline from 2011 through 2016. It is stupid to try to eyeball it, because that prevalence rate will be reflecting all kinds of things going on in tax which would be controlled for in the regressions. But without a break test, it seems odd to just run (effectively) the 2001-2012 model's estimates through 2013 onward as a counterfactual. Especially where the pre-period includes a lengthy period from 2001 to 2005 where it looks like noise around a pretty flat trend. And... aww crud. Googling around to see if anybody's checked for that. And somebody has. It looks like Japan Tobacco commissioned some work, and the first thing the consultant did was go for a structural break test. And they found breaks at 2005 and at May 2012, albeit just on the outcome time series and not in the controlled model because Chipty didn't share data. And so anybody so-inclined will just reckon I cribbed from some tobacco playbook - though I swear I did not see this until I started Googling. I hate one-sided skepticism: Chipty must be right because she was government funded, even if it looks completely obvious that a statistical break test was necessary and wasn't undertaken. Fun and games. Anyway, if you're an econometrician and that graph doesn't seem to be screaming to you that we can't just infer policy effects from a dummy variable for the post-2012 period and a linear time trend, let me know why. Traditional welfare benefits became harder to get after welfare reform; disability benefits require making a case that you're disabled. Much of the story is about the family's desperation to get the grandkids diagnosed as disabled in order to draw higher benefits. It makes sense that social services should be targeted towards those who are unable to work because of disability. But so-doing also encourages diagnosis-seeking. Welfare has horrible tradeoffs. Meanwhile, disability assistance in New Zealand [NOTE: see important update below], in real per capita terms, was flat from 1998 through about 2008, spiked upwards in 2009, and has since eased back to roughly where it was in the mid-2000s. Or at least that's how it looks in playing around a bit with Victoria Uni / NZIER's tables. All errors mine - I did the real and percap adjustments from their tables. It looks like the GFC saw a big increase in disability assistance, but with a reasonably sharp return to the prior level. The real per-capita figure rose from 1998 to 2008 and has since roughly flatlined. Another email correspondent tells me WINZ may be using the Supported Living Payment as a place to put difficult clients with whom they don't want to have frequent interactions. The Productivity Commission is to be looking at state-sector productivity in a coming inquiry. Measuring the productivity of public services is complex. The question is whether evidence of a lagging productivity performance tells us something about public services or more about the measures being used. In particular, the Statistics New Zealand data for the education sector do not account for changes in quality, yet the quality of products and services varies over time. Adjusting estimates of public sector productivity for quality changes is a challenging task. To illustrate, the Productivity Commission has just published work on quality adjusted productivity measures for New Zealand schools using sector-level data. This work shows the benefits and risks of different approaches and highlights differing results emerging from different quality measures. The differences point to the need to better understand what measures reflect the performance of New Zealand schools. There is still much more to do to better understand the productivity of New Zealand’s public services. And it is important not to simply point to poor performance, but to develop practical insights into how measures can help improve services. No single approach will work in all cases and no single organisation will have all the answers. Public sector productivity is a big problem for a few reasons. Was homosexual before the government finally got around to deciding that it shouldn't be prosecuting people for being homosexual. Efficiency in the pursuit of public bads is bad. Government produces many public bads. The same government that funded Alan Turing, killed him. The first part of that was a public good; the evil of the second part outweighs the first. Views on the desirability of efficient government depend on views on that government's benevolence. And there's much to be said for government stopping doing evil things before doing good things better. But leaving all that aside, you need to put some value on the outputs. There's plenty of stuff you can do to get closer towards one sense of cost-efficiency. Outsourcing, competitive tendering, and a lot of the outcome-based contracting under the Social Investment Approach will all give us a much clearer picture of the cost per unit of outcome. And the Social Investment Approach also gives a sense of the value to the government of those outcomes in terms of reduced long-term fiscal liability - which is a darned sight better than what we have had before. But it still doesn't really say how much people really value the outcomes. Patrick's link does go to some exceptionally interesting work on productivity in education; I'll follow up on that in a later post. It'll be interesting to see where Prod Comm takes the inquiry. I'm an optimist about getting better cost-per-outcome efficiency. I'm a pessimist that we'll ever get the right mix of outcomes. But I'm optimistic that we will eventually at least be able to stop the purchasing of bad outcomes. Occupational licensing in New Zealand just got a bit worse. Anne Tolley's announced that social workers will now have to be registered, and that registration will require meeting standards and on-going professional development for maintaining registration. Whitireia and WelTec Chief Executive Chris Gosling says, “The challenge for government agencies and NGOs is to make the investment to ensure staff are properly qualified and registered. We are very well placed to meet the new demand for training that will be generated by mandatory registration. The Bachelor of Social Work degree is the ideal pathway which allows graduates to meet these new registration requirements. I've asked MSD for the Regulatory Impact Statement on this one. The costs of this regime will start mounting as the qualification requirements go up. A new paper out in the American Journal of Clinical Nutrition shows there's an association between children drinking non-dairy milk, as opposed to cow's milk, and lower heights. The press release doesn't link to the paper. Here's the link to the paper if you're interested. The press release talks about associations but doesn't say anything about causality. Nevertheless, the author goes on about the lack of regulation of protein content in non-dairy milk. And hey, maybe that's what's going on. Reduced protein intake could be doing it. But it looks like the paper doesn't control for other part of kids' diets. If it's likely that kids on almond milk diets or soy milk diets are more likely to be on vegan diets overall or to have other weird diet issues that could also affect protein intake, it seems kinda odd not to adjust for other parts of the diet. And while they exclude kids with growth-affecting disease from the study, they do include asthma. Some folks exclude dairy as part of trying to control asthma, and inhaled corticosteroids can suppress growth among kids (though they catch up later). So it would be a bit premature to run the cross-price elasticities of milk with respect to non-dairy substitutes, multiply by the effect of supply management on milk prices to get the substitution into non-dairy because of supply management, then work out how much shorter supply management is making some Canadian kids. But opposition to Trump is nevertheless boiling over into attitudes towards the United States itself. It was no surprise that a Stuff/Massey survey this week recorded scant backing for Trump; 15.2 per cent in a theoretical world where Kiwis could vote in the US. Defeated Democrat Hillary Clinton scored 51 per cent and others – probably Bernie Sanders in the main – took the rest. Polls last year showed a similar trend. Given New Zealand's political spectrum starts somewhere to the left of the Democrats, that would likely be replicated in any Republican-Democrat run-off. But the biggest surprise was respondents' views in a three-way test of where our bilateral efforts should be aimed. About 42 per cent picked the UK, reflecting our historical links, 42.5 per cent went for China and only a paltry 15.6 per cent for the US. Put in the context of New Zealanders' (anecdotal?) suspicion of Chinese immigration, investment and land purchases – and the political hay made on those issues by NZ First and more recently Labour – that is a stunning finding. If New Zealanders are looking to China for leadership and bilateral links over the US (in a conservative and male-heavy sample) then something profound is going on. Tillerson did his best to address the policy issues and assert the US's commitment to the region and rules-based solutions. He reaffirmed its interest in trade deals – albeit bilateral ones where New Zealand will be well down the pecking order or, even more ephemerally, multilateral deals in the future. New Zealand has a free trade deal with China; America doesn't really do free trade anymore. Koordinates hosted a fun event yesterday on open data. Ed Corkery, Koordinates CEO, opened with a talk on the potential of open data in GSS-space, once it's actually opened up in useable form. Too much data winds up being inaccessible or unusable; Koordinates works to try to make that data more easily used. Statistics NZ's Government Statistician, Liz MacPherson, presented next. She has a great vision for where open data should be at. We're not there yet, but I like the kind of future she's describing. In that world, IDI users share all of their code. That means that you don't just get replicability and a lot more potential for error-catching, you also get standardised bits of code that can get dropped into projects. So if one person's already run the code that matches, for example, students' NCEA records to later income tax data, somebody else can just grab that bit of code rather than have to re-create it. There's recognition of that Stats needs to be careful not to break its current social licence as a trusted repository of data, but that there are ways of doing that while also being far more open than Stats has been. It's work in progress, with all kinds of real technical hurdles. Antiquated back-end systems generate reports that turn into the current tables, with dependencies all over the place, making it tough to shift towards the more flexible and dynamic environment that would allow cross-tabs to be generated on the fly. Get far enough into that world, and you don't even need Confidentialised Unit Record Files any longer. Instead you can get privacy and confidentialisation on the fly that scales confidentialisation to the risk of deanonymisation given the kind of data being extracted. One easy thing that Statistics NZ could do, as an interim measure while everything else is going on, would be to open up the CURFs. And that's a good chunk of what my talk focused on. I just can't see any good reason that these things are still locked up behind difficult access barriers when America's PUMS are all available to anyone in the world who has a browser. Liz described me in her talk as one of Stats' NZ's most vigorous critics. But I love Stats NZ. I just get frustrated that the CURFs have been locked up forever, and that what we're able to do here is so far behind what can be done with American data because of the access controls. And that's especially frustrating when so much NZ data held in IDI is so much better than that which can be done with American data. It'll take time to sort things out on the back-end so that we can get front-end interfaces that match what IPUMS is already doing in American data (and that Berkeley's SDA engine has been doing for ages now), and some of that is unavoidable where there are resource constraints and a pile of old systems that need sorting out. But why not open up the CURFs in the interim? It would also help signal the change in approach at Stats, in line with the Government Statistician's vision of real open data. Flip the switch! Free the CURFs! And, just to be on the safe side, put in a big real penalty for anybody who takes the CURFs and uses them to re-identify individuals. There's an important recommendation missing from the Parliamentary Commissioner for the Environment's list of things to help endangered birds. It hardly would work for all birds, but it is ridiculous that it is banned for those birds for which it would work. 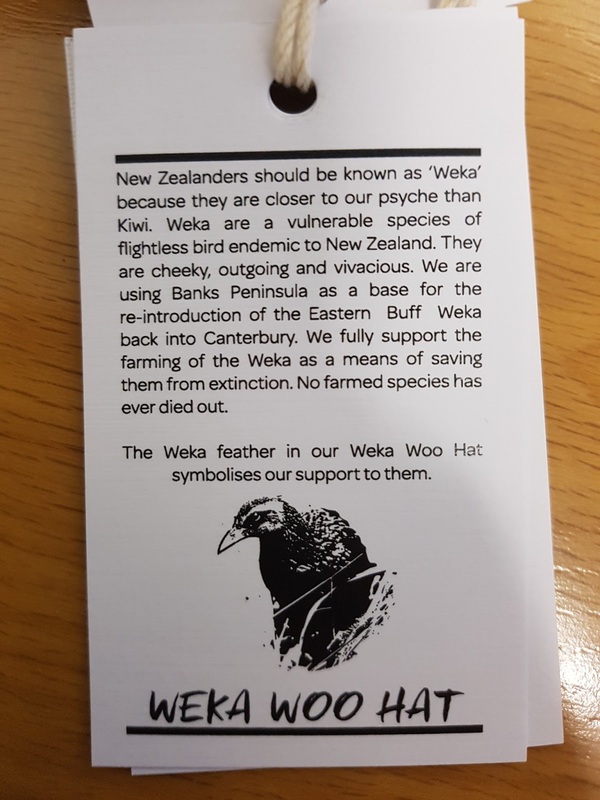 Roger Beattie has demonstrated that he can successfully raise weka. There would be ample specialty markets for the birds. But DoC seems to consider him a menace rather than a savior for those birds. 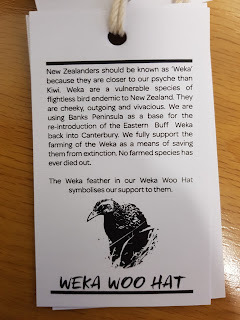 He made the case well on the tag accompanying his Weka Woo hats. The nature of research is that there are no guarantees of success in the laboratory, let alone practical application in the real world. One approach may be very effective, but would face many hurdles in becoming registered for use; another may be the opposite. It is important that all options be kept open, and that research money is not prematurely funnelled into one area. Approaches that rely on some kind of genetic modification are likely to encounter strong opposition from some. But the use of genetic science does not necessarily involve modifying genomes. Nor does the use of genetic modification necessarily involve transferring genes from one species to another. Some techniques, like the Trojan female and gene drive, once introduced, will spread through predator populations by themselves. This attribute will make such techniques very cost-effective, but is likely to create public concern. Informed and early public discussion about different methods for using genetic science for predator control will be essential. Such discussion should not only cover the risks associated with such methods but also the promise they hold – the widespread control and potential eradication of the predators that are killing many millions of birds and other native wildlife every year. The Royal Society of New Zealand has set up a panel of experts on gene editing. I also strongly support their recommendation to better levy visitors to the conservation estate for conservation services provided. It is absurd that there is not an access charge, with a relatively low fee for domestic visitors and a relatively high fee for foreign visitors. Access to Canada's National Parks requires purchase of a parks pass, and it is easy to charge foreign visitors more. Those things that can be funded through user fees should be, and if your worry is you might limit access to those on lower incomes, remember that it's a mistake to try to solve an incomes problem by screwing up relative prices. Last time I flew domestically in New Zealand, I had to make sure that my spare lithium battery pack was in carry-on rather than checked. It's safer that way because a fire from a shorted battery can be contained in the cabin but can't be so easily contained in the hold. America's looking to broaden its ban on laptops in the cabin. Rather than just affecting flights from the mid-east, where there might be somebody planning on making a laptop-bomb that could be activated from the cabin, it may extend to all flights. Pretty good trick from the bad guys' perspective, if batteries in the hold are risky. Restricted to places with a relatively high risk of laptop bombs, maybe the ban passes cost-benefit. Applied everywhere, the tiny risk of any laptop spontaneously catching on fire adds up across all laptops and likely dominates bomb risk. That’s why the United States Postal Service stopped shipping products with lithium batteries overseas. It is why Federal Express classifies lithium-ion batteries as "dangerous goods" and imposed strict rules about how they must be packaged. It is why the Air Line Pilots Association has called for "comprehensive regulation governing cargo shipments of lithium batteries." When I asked [security expert Bruce] Schneier whether he thought as I do that the odds of a crash caused by a battery fire in the cargo hold was higher than a terrorist attack using a laptop bomb, he replied that there was "simply no way to make the numerical comparison." But, he added, "My intuition matches yours." Simplest solution is just to continue avoiding travelling to the United States until it is less of an insane asylum. But please let's not import this bit of American nonsense here. Not much we can do about it if the US requires it on all flights to the US, but we can avoid imposing it on ourselves. Here's Rossman on social constructionism. All of that makes twitter discussions around social constructionism less constructive than it might be.